This week has been Welsh Culture Week. We enjoyed singing Mr Hapus and we played a memory game using lots of Welsh objects. We also had lots of vegetables in our water tray so we used big spoons and bowls to pretend to make Cawl. 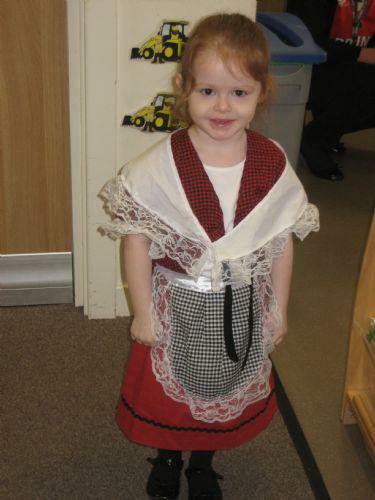 On Friday we had lots of fun dressing up in our Welsh costumes. Don’t we look fantastic! We have been looking at frogspawn this week. We looked very carefully at the little jelly circles and we noticed a tiny black dot in the middle. Miss Woolley told us that they will grow into tadpoles soon and then if we look after them they’ll turn into frogs! We have also been to the school pond. We used long nets to try to catch fish, tadpoles, pond skaters and water snails. We put the things we found into trays and then used magnifying glasses to look very carefully at all the things we found! We’ve been looking at frogs this week. We looked at lots of pictures of different frogs and we talked about how many legs and eyes they have and how they move. We then painted our own picture of a frog. Some of them are on display in our cloakroom. They look great! This week we’ve been learning about different types of weather. We talked about how different weather makes us feel. We looked at pictures of cloudy, thundery, sunny, foggy and rainy weather. Some of us like the rainy weather so we can jump in puddles but most of us like the sunny weather when we can go to the beach. We used some musical instruments and tried to make sounds like thunder and rain. It got very noisy in the classroom!